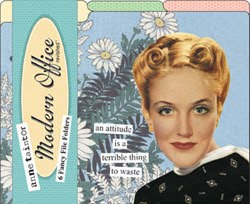 Anne Taintor takes beautiful vintage pictures of various women and combines them with fun phrases to make various items like magnets, pill boxes, bags, notepads and more. I hope you can tell by my website design that I am a huge fan of vintage and retro. I was recently sent some items from them to review. I was sent a 6-pack of Fancy File Folders with phrases like “an attitude is a terrible thing to waste”, “stop me before I volunteer again” and “and to think that I’m only using one-tenth of my brain.” These are so cute. I couldn’t decide whether I would take them to work, or use them at home so I split them and took half in. I love things that dress up my office and seeing these in the middle of a busy day will be a welcome sight. I also received a set of 6 coasters in three different designs and a fun purse-sized emery board set that says “born to be wild”. My favorite saying is on one of the coasters “she was one cocktail away from proving his mother right” – very cute and fitting for a coaster. Make sure you stop by their site and check out everything they have. Before our next trip out of the country, I will be placing an order for their passport wallet that says “we all have our baggage”. I kinda hate how great those vintage women pictures look. Here I am, grungy from cleaning house again.